CLEVELAND, Ohio — More than a dozen taxi drivers are dropping out of a dedicated cab service at Cleveland’s airport because they don’t want to drive vehicles with signs promoting the upcoming Gay Games. Gay Games taxi roof ad. 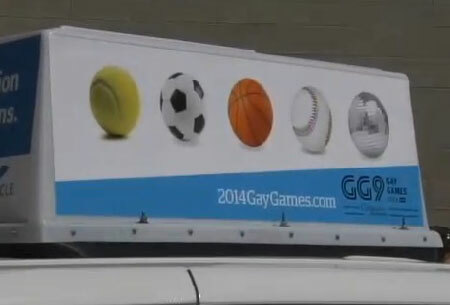 WOIO-TV in Cleveland reports that at least 17 drivers have refused to drive cabs with Gay Games signs. Most of the drivers are Muslim and have cited religious objections, the station said. Cleveland Hopkins International Airport hosts a dedicated service in which three local cab companies use special vehicles and preset rates. Gay Games Executive Director Tom Nobbe told Outlook Ohio on Friday that the cab drivers’ objections run counter to the overall reaction to the international event in northeastern Ohio. Organizers have offered to line up LGBT-inclusive diversity training for transportation, safety, hospitality and other businesses and agencies whose employees will help Gay Games visitors, he said. “This could accelerate those efforts,” Nobbe said. The ninth Gay Games, featuring competitions in 36 sports, is scheduled for Aug. 9-16 in Cleveland and Akron. Organizers expect 30,000 participants and spectators. Airport Director Ricky Smith issued a statement confirming that two of the service’s three cab companies – Ace and Yellow Taxi Cab – had drivers drop out of the airport program because of religious reasons. He said they will be replaced within three weeks. © Outlook Media. Ohio's statewide LGBT news source.